In 1966 after making the movie, ”Nashville Rebel” (picture from Nashville Rebel in 1966) it was time to go on the road and get his music back to the people. Lucky Moeller got Waylon and the band a total of $600.00 a night. His second L.P. came out in late 1966, “Folk Country”. It was 1968 the year of “THE GOOD, BAD AND THE UGLY”. Waylon’s dad died of a heart attack back home in Littlefield; Waylon was very close to his dad. He would meet up with Mirrian Johnson (Jessi Colder) again. She was divorced from Duana Eddy. R.C.A. signed Jessi up with Waylon and Chet Athins to make her first L.P.
"I've been married more than some family's"
It was 1969 and things were not the best for the band or Waylon. Jessi was the light in his eye and his drummer, Richie Albright, was thinking of Phoenix. Las Vegas in a way had a few things to do with the good bye of wife #3, the bad fights were in Vegas and #3 went back to the Valley of the sun. In Vegas Waylon saw a billboard and a song was coming together, the billboard said, A GOOD HEARTED WOMEN SINGING WITH A GOOD TIMING MAN. It would be some time but it all came together with GOOD HEARTED WOMEN… in 1972 with Willie Nelson writing a line. Working the road led to hard times on his marriages. His love life came together when he met Jessi Colter. On October 26, 1969 she became Mrs. Waylon Jennings, and people who know Waylon believe it was the best thing to come down the pipe. After years of putting up with the Nashville way things came around for Waylon, when his drummer said "Lets do it one more time". The song "THIS TIME" got things going. One more ugly thing was Waylon’s pill thing was not going away; when he was on the pills his attention span was pretty short. Sometimes it was hard to even talk to him. 1970 and Waylon’s music was coming together and A & M records jumped on the band wagon and came out with “DON’T THINK TWICE” songs he did before he was with R.C.A. On March 11, 1970 Waylon would get a Grammy Award in Las Angeles for “Macarthur Park”, no way a country song, but it got Waylon’s name out in the music world. Also in 1970 a new guy came on the payroll, Ralph Mooney, who Waylon would introduce as "the best steel player in the world". 1973 and Tonk Tonk Heroes, an album long time in the making. Waylon had cut tracks on two of the songs back in 1971 & 1972, but R.C.A. did not think the time was right, but Conway Twitty's record company put the songs out that could make women hotter then the Phoenix sun on the 4th of July, but R.C.A. told Waylon that "BLACK ROSE" was considered a bit strong for country music. R.C.A. had the tracks in the vaults for years. I'm sure the words to "ARE YOU SURE HANK DONE IT THIS WAY" were in Waylon's head long before he wrote the song. In 1972 Waylon and R.C.A. were getting along better, R.C.A. gave him more freedom and the songs were better and more like Waylon wanted. He had his own people in on the recording part of things. The road was still hard, but Waylon could not just set around Nashville and besides he wanted his music to get to the people who were buying his records. With Jessi by his side it was on the road again, or still. Back in Nashville and still wanting to make records he bypassed R.C.A., making records at Tom Paul Glaser's Independent Studio and doing them his way. R.C.A. went along with his, Broke Precedent, adding the rise of Nashville's' independent studios. In 1974 Waylon had his first #1 with "THIS TIME". A song he almost put in the back of everything, but again his friend and drummer, Richie, talked him into doing "THIS TIME" one more time. The 1970's were good for Waylon and R.C.A. $$$. R.C.A. 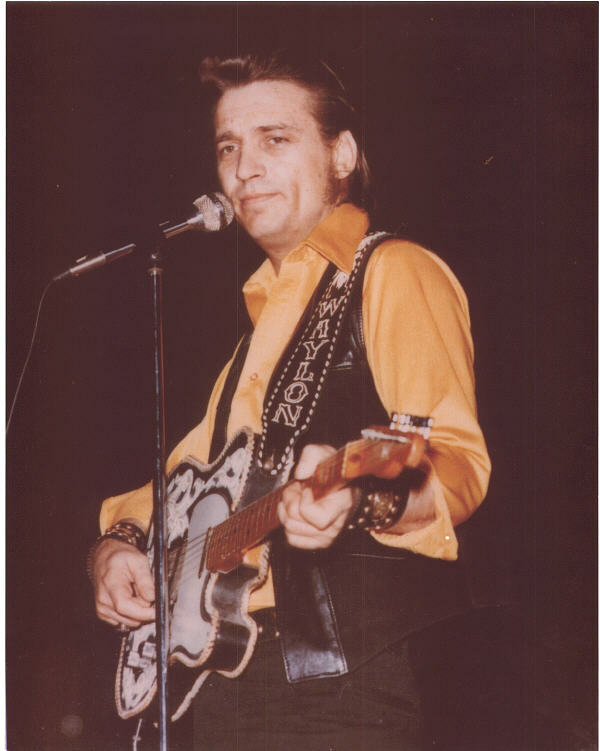 still had a lot of Waylon's songs in the "can", but Waylon was on a roll with his music. "DREAMING MY DREAMS" lyrics by Allen Reynolds cam out in 1975 and to this day Waylon still likes the song. With liner notes by Neil Diamond how could he go wrong. Waylon has said it is one of his all time favorites songs. 1976 and LOOK OUT NASHVILLE - Waylon, Willie, Tom Paul, the record world did not know what to do with these guys. Wanted-The Outlaws, was the first country album in history to sell over a million copies (and the hair got longer). The press and Nashville jumped right into the Outlaw thing--it was the big thing--Long hair got longer and the music got better. Also in 1976 came "ARE YOU READY FOR THE COUNTRY" (hello, Neil Young) The album was one of Waylon's' best. In 1985 Waylon would pay Neil Young back and do an album with him called "OLD WAYS". One cut was "BOUND FOR GLORY", and if some how anyone missed that one go to the ol' record shop and get it. Waylon and Neil Young at there best. BUDDY HOLLY's original band, J.I. Allison, Joe B Mauldin and Sonny Curtis were on the road doing a little rock n' roll and a little country too when Waylon put them on as his opening show and putting J.I. Allison on as full time drummer. About the same time J.I. & Joe B. were looking for Buddy's ol' motorcycle, a 1958 Triumph. After finding it they gave it to Waylon on his birthday. 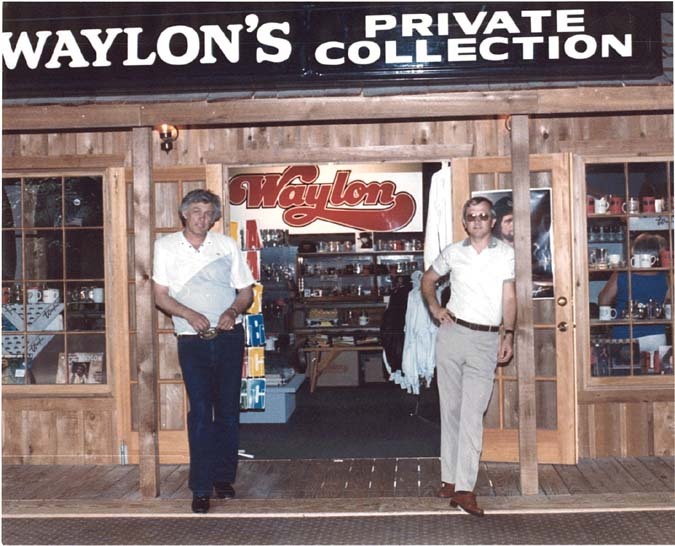 For years Waylon had it as part of the "Waylon Private Collection". A place in Nashville at 118 16th Ave S. At the time it revealed the man behind the legend, visitors could view the personal and treasured belongings of Waylon, his family and friends. Sad to say, but a few years ago he closed it. September 7th, 1979 the city of Lubbock, Texas came to terms with the legend of Buddy Holly and Waylon and the Cricket's played in the Civic Center Auditorium. The concert was held for proceeds to construct a WALK Of Fame at the Center and for a statue for Buddy. Waylon, like Buddy, had to leave his hometown before he could do what he did best. He was born on May 19th, 1979, Waylon Albright Jennings, the new son of country music's premier superstar and his singer wife Jessi Colter. On October 10, 1979, Nashville played an old country song with a new beat, the formal christening of Waylon Albright Jennings, and there's not a cowboy hat in sight. One of Waylon's heroes, Muhammad Ali flew in for the special occasion and former roustabout buddy, Johnny Cash, buy no country music and no paddy kickin' boots. 1979 came to an end as a very good year. 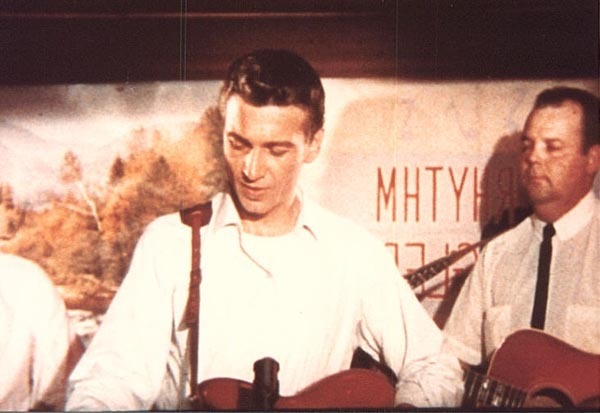 Around 1979 Waylon did a session with The Crickets and one song Waylon did was a song Sonny Curtis wrote after he saw the movie The Buddy Holly Story, "The Real Buddy Holly Story" and a couple of songs with Sonny singing which sad to say remain unreleased.